Richard says, "I didn't see any of this artwork at the time, though I made the suggestion to put an image of the band on the cover, with Astor as the wild drummer, her hair flying out everywhere, her face and shoulders dripping perspiration. (Maybe I'm remembering one of the first female drummers, Mo Tucker of the Velvet Underground!) Nothing wrong with the suggestion, but it didn't work out visually. I never realised just how much trouble went into these early versions. 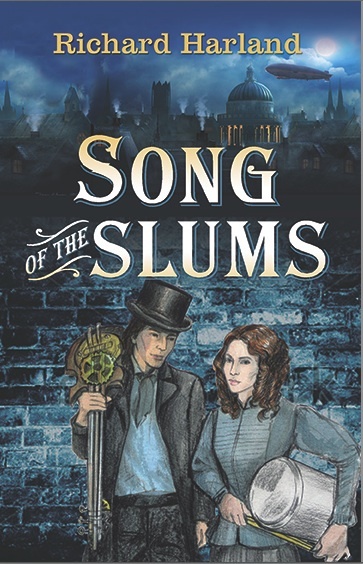 I guess that's the trouble with a photo cover as against an illustration cover - you can't just knock out a sketch for the publisher to look at, you have to do all the searching and researching for suitable images before you can even show it to the publisher. 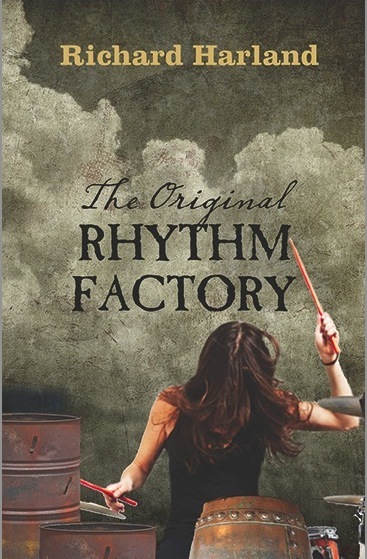 The cover on the left goes back to the time when the book was still under the title of The Original Rhythm Factory - check out the "Writing the Book" pages for all the different titles it went through! Drums made of steel barrels and kegs and such - all suitable. Then there was another version where Cathy had discovered a wonderful Victorian London skyscape. Apparently it took her ages to track down the owner and acquire permission to use the image - but it's the one element that survived all the way through to the final cover, and no wonder. Still The Original Factory at this stage. But saying it's a good one isn't the same as saying it's the best. Compare it to the final cover, and it pales in comparison! That's a publisher's job, to keep on pushing and pushing to get to the absolute pinnacle. A cover is so important to sales, the tiniest difference in quality can have a huge impact! Also, I think there could have been a couple of other criticisms. 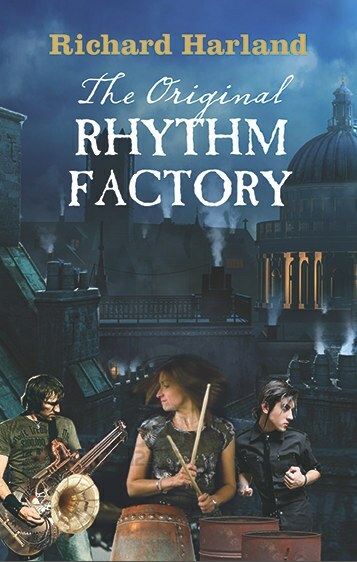 It doesn't really convey the Victoriana feel of a steampunk novel, and the band is a bit inert, a bit static. Of course, it would have had more work done on it, to get a better blend of colours and separate imported images, but still, the fundamental limitations would have remained. So far, so frustrating! Erica and Sarah, my publisher and editor, had given a fair trial to my original suggestion - maybe fairer than it deserved. Now they came up with a proposal of their own. The next cover is the first one to use the final title. This is where Cathy was having so much difficulty finding photo images that would work that she did an illustration of her own. She tells the story - "Then it was decided to just focus on the 2 main characters walking along an atmospheric street with some instruments. I did some photos with friends to use as reference for a painting. I knew I would need to change clothing and make up the extraordinary steampunk instruments." Better blend of colours, and definitely has that Victorian feel - but although the illustration conveys the two characters, it doesn't convey excitement. As Cathy has said, it's hard to get a really dynamic sense of action into a relatively realistic painting - i.e. unless it's out-and-out cartoon-style. "This was all too static - a bit more movement and excitement was needed. Also I was drawing the figures against a flat brick wall. it was felt I needed a laneway leading away with the characters running away from the viewer." Still, from Cathy's point of view, the cover brief was finally becoming more definite, and she had something to get her teeth into … leading to the First Version. PS Notice the first appearance of the zeppelin, as a neat shorthand signal to say that this is a steampunk story! It's photoshopped in from a separate image, which sounds easy - until you realise that light and tone and everything all have to be made to match!